I just had the pleasure of reading this great book a second time and it was just as good as if I'd read it the first time. I've become a Candace Calvert fan of late after discovering her books a few months ago and this one is neck and neck for favorite alongside Trauma Plan. But I'll discuss my love for both books in another post. I realized what it is I love about these books - they combine contemporary fiction with romance, drama (medical drama to boot and I really like that), some intrigue and mystery, hunky heroes and strong yet loveable heroines - a perfect combination for me! 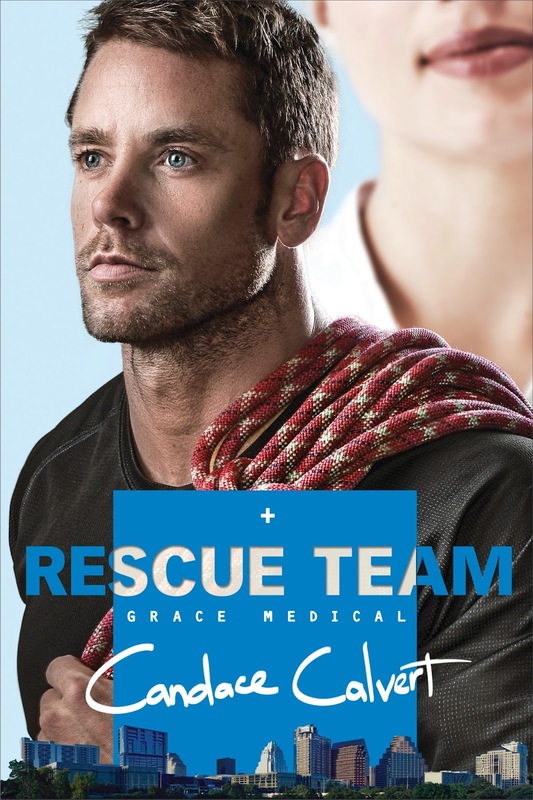 Speaking of hunky heroes and strong yet loveable heroines Rescue Team has two awesome ones. Wes Tanner is actually described like the guy on the cover (always a bonus) and he's a determined but quieter hero. After Jack from Trauma Plan, it was nice to have a quieter guy on the scene! Readers met Kate in Trauma Plan and she was an intriguing character even back then. Kate is hard to love because she doesn't feel worthy of anyone's love and the journey she takes with Wes and especially her father is really touching. I cried towards the end, as I so understood the emotions going on at that point in the book. Wes needs to rescue people (stemming from events from his childhood) and Kate isn't interested in being rescued - she can handle life all by herself. Haven't we all thought that at some point? Hasn't stuff from our past kept us from truly moving forward? This is the stuff that pushes Kate and Wes forward, making them deal with things they'd rather not. Coupled with all this is a pushy hospital attorney, a missing ER director who was basically a saint (adding to Kate's woes) and disaster after disaster at the hospital pushes everyone to break point. Yet the characters find the courage to start the healing process and move towards reconciliation with family and themselves. The romance between Wes and Kate is at times funny but I found it to be genuine. He's attracted to her, even though she prickly. She's attracted to him, even though he's bent on saving her. They clash, but underneath they really need each other. I really liked how Wes did respect the distance Kate demanded, it was hard for him to watch her emotionally withdraw but respecting it made him all the better a man. He did though, ignore her emotional withdrawal when she was too stubborn to admit that she needed him and this is why I love this quiet hero. He acts when he needs to and withdraws when it's required of him, even if it kills him. Thank you Candace for giving your readers such a well thought out novel, filled with depth, love, emotions and for not hitting your readers over the head with faith and Christianity! I love my Christian fiction books, but sometimes, it drives me nuts when the Bible is quoted endlessly and characters do not act like they are human - by making mistakes all because they are a Christian. Candace this is not you at all with your books. I so appreciate this thoughful review of my newest book--such an honor to have you "scrub in," Jessica.